On Friday, I went to Newcastle on Tyne with a couple of friends. 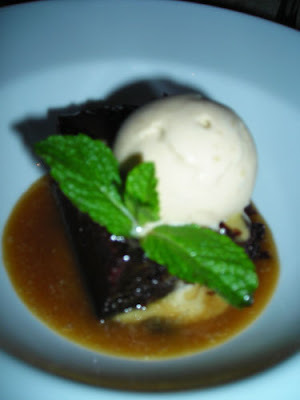 We dined at The Blackfriars Restaurant The food was delicious and the service was excellent. 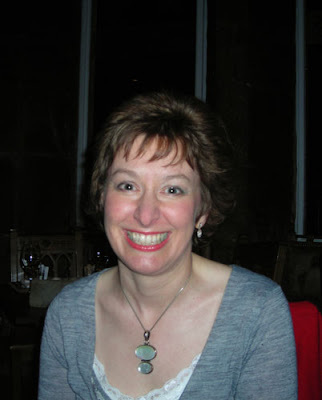 My friends preferred not to have their photographs displayed on my blog, but here I am in the restaurant. Apologies in advance for the rubbish photographs, I didn't want to take my DSLR with me, so took my little Nikon Coolpix L2. I'm only just realising now just what a difference my camera is making to my food photography. We started with a glass of bone-dry Mananilla Sherry from Andalucia. 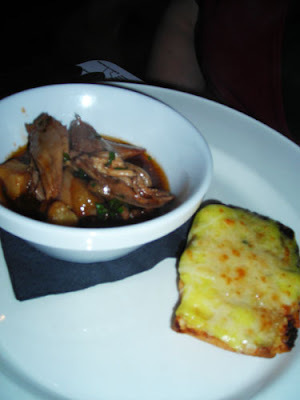 An so to the Starters: This one is Confit of Cumbrian rabbit stew with Geordie rarebit. 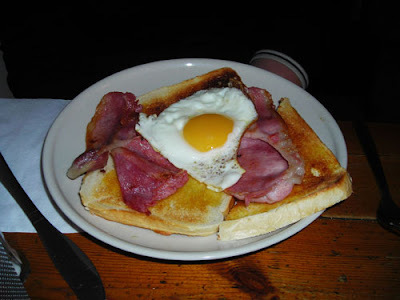 We didn't ask, but I assume the Geordie rarebit contains some 'Newky Broon' or Newcastle Brown Ale lol! I was very impressed with the vegetarian options on the menu, those who follow this blog will know that I like my meat so these had to be really good to tempt me. 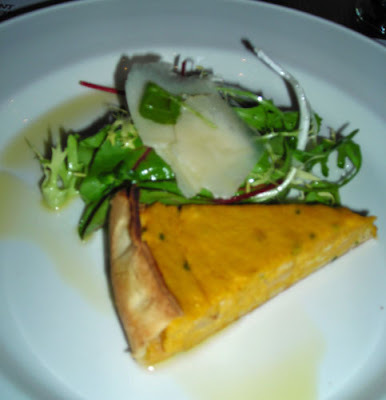 The flan above is Pumpkin and Rose Petal Tart with Honey Vinaigrette. 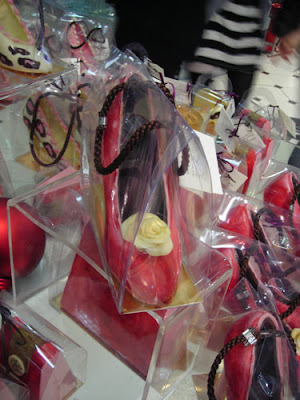 It was very tasty but I have say, I couldn't taste the rose petals. 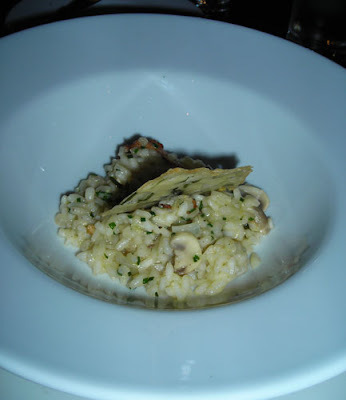 This is the Locally foraged mushroom risotto with Parmesan and Tarragon Crisps. And now to the MAINS! Again I was seduced by the Veggie option and I was not disappointed! 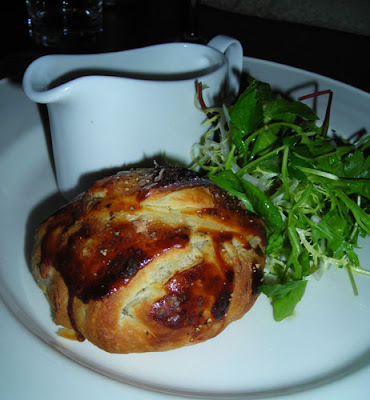 Here is what the menu said: Locally foraged mushroom, Yorkshire Blue & walnut Wellington with sage cream sauce. 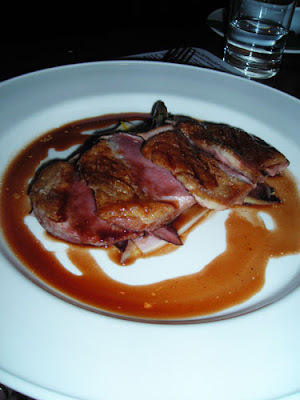 Above: Barbary Duck breast, orange caramelised endive and redcurrant jus. 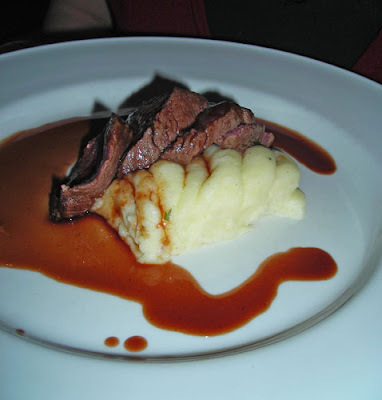 Loin of Scottish Venison, celeriac & truffle mash, wilted spinach and Port sauce. We drank 2006 Matakana Estate Pinot Noir, Marlborough, NewZealand. Only two of us opted for dessert: above is the Vanilla Rice Pudding with Cherry & Brandy jam and below my option of Sticky Toffee Pudding with Banana Ice-cream and caramel sauce. 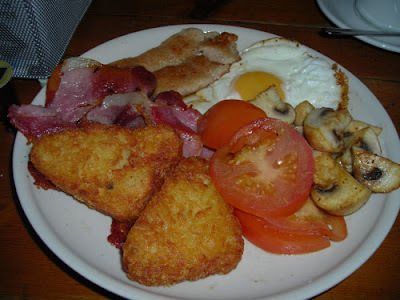 My friend were amused by my insistence on taking photographs of the food and were keen that I continued with our breakfast next day! I went for the Full English (above) a bargain at only £3.30 from a little cafe on Mosely Street which was 'established in 1978'. To add to the atmosphere 'Sounds of the Sixties' was playing on Radio 2 in the background lol! 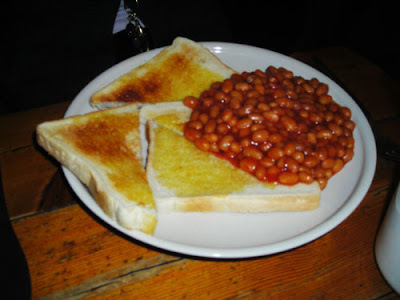 They also offered, beans on toast. and bacon and egg on toast. We had a great time in Newcastle, the independent department store Fenwicks is outstanding, we loved the food hall, the beauty section, the cook shop and the designer clothes. 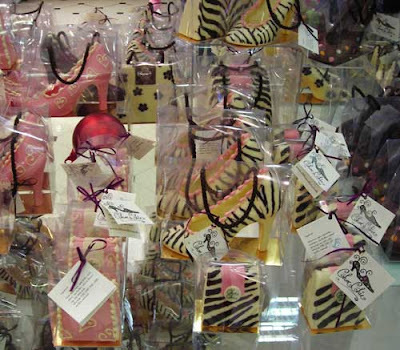 Mmmm chocolate shoes and handbags! Great choice - Blackfriars is reliably good! 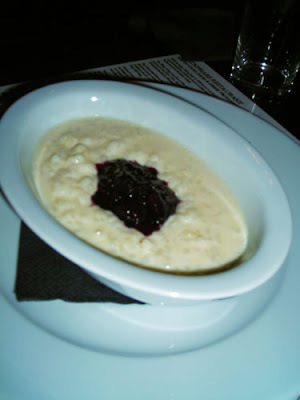 The veggie options look interesting and that rice pud looks very tempting with the jammy puddle! I wish I could've gone with you!!!! I am sooo glad that you didn't eat the bunny. It looks lovely, but I'm with Tracey on the full english!!! I've never been to Blackfriers, its always been on my to visit list though! Very cool post! I am so happy to meet you and I totally can relate to the challenge of taking pictures out in dark restaurants with a digital camera. That happened to me for my Fireside post! Wow, pumpkin and rose petal? I would have had to try that too. How amazing they had such fantastic vegetarian options, love that! Of course I am a meat eater but I know just how much of a challenge vegetarian dishes are, I used to be a vegetarian! I should also mention I will be back online some time next week after I have recovered a bit, LOL, just over did it.